And now for some things that are not for sale! Due to lack of funds, having been made redundant last July, I cancelled all our charity direct debits and told charities I would not be buying any more raffle tickets. This made me feel bad, so I decided to offer my services to the local special care baby unit with the dual function of being useful to them and reducing my stash. 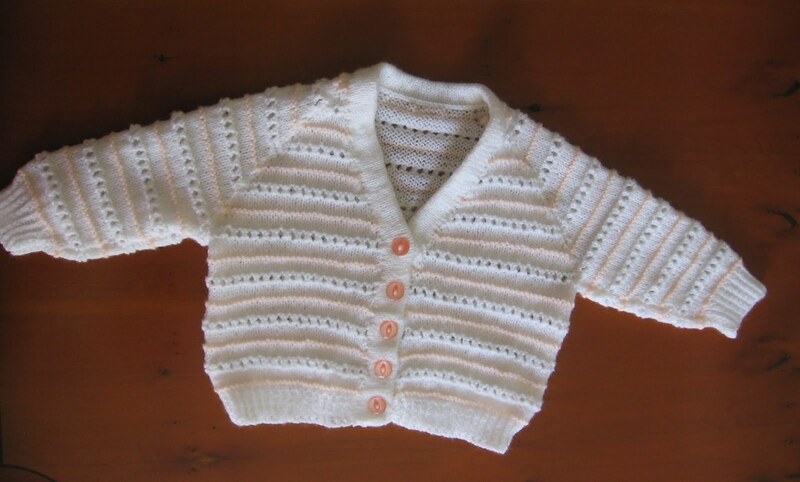 They asked me to make newborn size cardigans and blankets the right size to put on babies in their fishtanks (well, that's what I think they look like!). 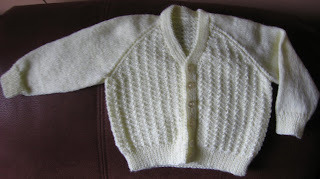 I was especially glad to do cardigans as I like doing baby cardigans, but particularly in 3 or 4 ply as the DK ones you see in so many charity shops and on craft tables make babies looked all bunched up to me, whereas the finer yarn gives a cardigan that gives that little bit of extra warmth without restricting baby's movement. Well, that's my opinion anyway. The ones featured above are ones I have given to SCBU. I also did one like the striped one in blue with white stripes (got a lot of blue to get through, bought on ebay when I thought I was going to sell lots of stuff on Etsy - didn't happen!). Some others I did previously are shown belown. The plain white one like the striped one (or white with white stripes!) was made for a work-mate's baby. The other white one was the second one I made to this pattern. The first one was for my cousin's baby and the second one was to be sold and I actually did sell that one to the lady I was working for at the time, whose sister was pregnant. Managed to get these photos sort of lined up how I wanted with help from Susan. That's enough for one post, so will put up some blankets later/another day. Hi, thanks for dropping by my blog. I will definitely put my needle roll on there when I get a second to make it! Well done on all the cardigans and blankets, by the way. My twins spent 6 weeks in the SCBU in 'fish tanks' and the clothes there were so appreciated by all the mums with sick babies. Keep it up! 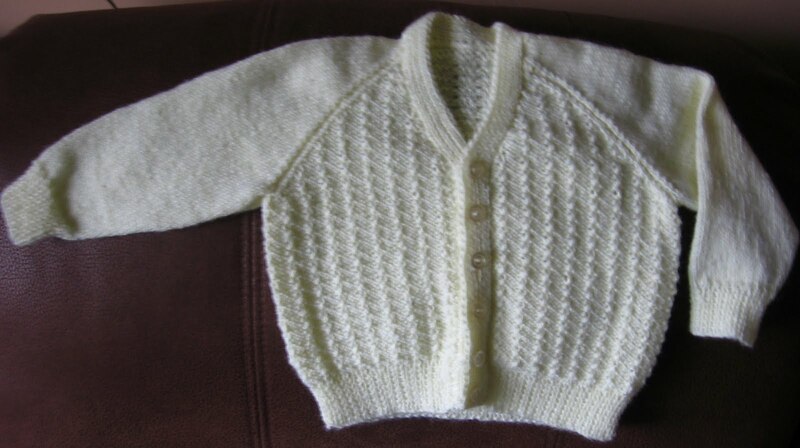 I like the beautiful baby sweaters. Also, I must try making socks one day; yours are lovely!